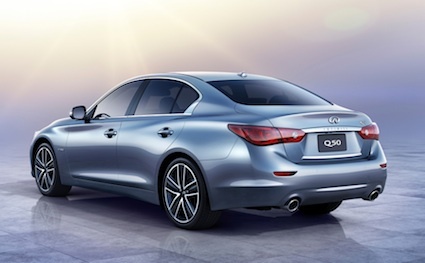 Infiniti’s new naming convention is rolling in with the 2014 Infiniti Q50 replacing the 2013 Infiniti G37. The new model is redesigned and is priced from $36,700, plus a $905 destination and handling fee. That brings the Infiniti Q50’s base price up to $37,605 or $650 less than the $38,225 charged for the 2013 Infiniti G37, delivery fee included. 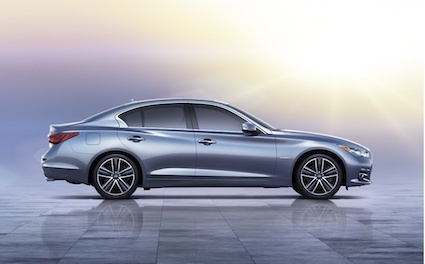 The 2014 Infiniti Q50 is powered by a 3.7-liter V-6 engine. A hybrid edition, featuring a 3.5-liter V-6 engine, is also available. Both models are available in rear- and all-wheel-drive arrangements. Sport or “S” versions of both gasoline and hybrid models are available, pushing the highest base price up to $49,055, including destination and handling. In all, the Infiniti Q50 line is represented by 10 packaging levels. The new sedans go on sale nationwide in early July. The Infiniti Q50 introduces three new technologies not previously offered elsewhere: Infiniti Direct Adaptive Steering technology, Active Lane Control and Predictive Forward Collision Warning (PFCW). Infiniti describes its new steering system as allowing for “advanced control of the Q50’s tire angle and steering inputs, transmitting the driver’s intentions to the wheels faster than a mechanical system.” Its Active Lane Control system makes use of a camera-based lane marker detection system, while its Direct Active Steering system has been designed with improved lane-keeping capability. Essentially, the new system centers the sedan better than the previous system. 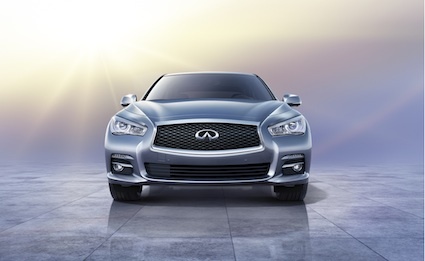 Infiniti’s PFCW system was engineered to warn the driver of risks that lie beyond the driver’s field of vision. PFCW determines the relative velocity and distance of a vehicle directly in front as well as the vehicle traveling in front of that one. Therefore, if you are following two vehicles, PFCW “knows” what both vehicles are doing. Infiniti will have a huge marketing challenge on its hands beginning with the 2014 model year. That’s when its old naming convention is thrown out and a new one is assumed. The G37 sedan is now the Q50 sedan, while the G37 coupe and convertible will sport the Q60 name. The previous M series becomes the Q70. For crossover and SUV models, the naming convention adds an “X” to the nomenclature. 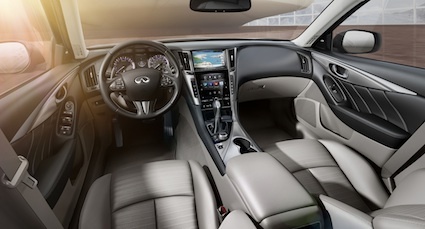 Thus, the Infiniti EX becomes the QX50 and the FX transitions to the QX60. The current Infiniti FX becomes the QX70 and its largest SUV, the QX56, becomes the QX80. Nomenclature aside, the Q50 brings forth other changes of note. The model will offer Infiniti InTuition, what Infiniti describes as “a fully customizable digital environment for linking various driver settings and driving characteristics to their Infiniti Intelligent Key.” Also included is Infiniti InTouch, representing the brand’s next generation connectivity, including dual touch-screens and updated functions, features and custom apps. The changes for the new model will enable Infiniti to keep up with its chief competitors including the Lexus IS, BMW 3 Series and the Acura TL. As for the rest of the Infiniti line, you may need to have a scorecard at the ready to track the model naming changes that coming upon us.